We currently offer PayPal, and credit/debit cards via PayPal as options to join LeadsTunnel! Enter your credit or debit card information and complete payment to join! Please Note All payments are processed securely through PayPal. 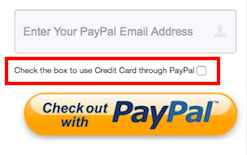 If there is a limiting factor for your PayPal account OR your credit/debit card, the payment method may not be available.